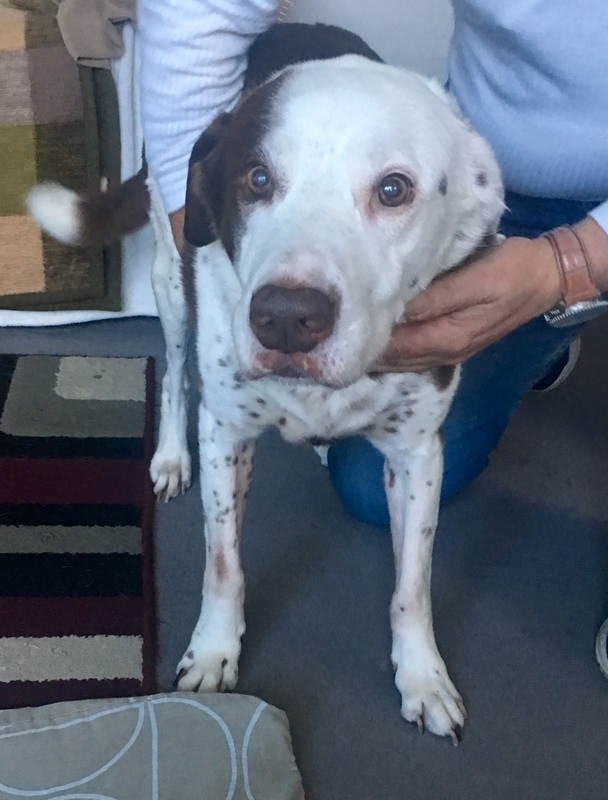 Jack is a 13 ½ year old Springer/Lurcher/Staffie. He is now stiff with osteoarthritis all over exhibiting worse in his hip joints which have weakened. But other than his mobility issues, his Mum described him as in remarkable health for his age. That may well be down to the extensive research and care his Mum is taking for him. She checks out the pros and cons of everything. When I arrived, I was handed a list of the medication, supplements and food he is on – everything meticulously studied and balanced. And all his food is hand made with the same amount of care. Mobility-wise, his Mum said he is a ‘plodder’. He was tentative when he got up and equally deliberate when going down – front end first then his backside. He needed a little extra to complement this jigsaw of multimodal care. Adding manual therapy is something that can give him a lift and, equally important, something his Mum can do daily along with all the healthy food preparation. He was one of the “I love this massage and shall lie here……. Although maybe I’ll get up now and come back in a minute” dogs. Massage was on his terms. But when he was in the zone, he fully went with it, closing his eyes. After an hour I handed over the skills to his Mum, who took to physical therapy like a professional, not that I had any doubts. We also went through a few gentle stretching exercises and our simple, quick and effective warm-up / cool-down routine. Just before he left, he lay down, front and rear at the same time, without any hesitation – a big indicator of the benefits of the session. And later in the day, him Mum send me a post-session picture – a snoozing relaxed Jack. It was never in any doubt that Jack’s Mum would fully embrace this addition to his therapy regime. This entry was posted in acheypaw, achy paws, AchyPaw, achypaw myotherapy, arthritis management, Brighton Dog Massage, canine arthritis, canine arthritis management, canine myotherapy, canine myotherapy, dog myotherapy, achypaw myotherapy, myotherapy, achy paws, confidence boost, Dog, Dog massage, dog myotherapy, empowerment, massage benefits, multimodal, multimodal therapy for dogs, myofascial release, senior dogs, south coast dog massage, south coast myotherapy, Testimonial, Therapeutic, therapeutic massage and tagged acheypaw, achy paws, achypaw, achypaw myotherapy, achypaws, arthritis management, canine arthritis management, Canine massage, canine myotherapy, Dog massage, dog massage classes, dog muscle therapy, massage, south coast dog massage, therapeutic massage. Bookmark the permalink.